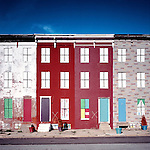 Middle East is a neighborhood in East Baltimore located just to the north and east of the Johns Hopkins Medical campus. Since around 2000 its has and continues to undergo a massive redevelopment project by which hundreds of people were relocated and several blocks of dilapidated rowhomes were leveled to make way for a Biotech Park, new housing, and also a school. Former residents were promised they'd be able to return to their neighborhoods. In some cases they were told their homes would be rehabbed. However the crash of the economy in recent years has slowed the project and a lot of vacant land remains presently. There has been some progress. A new school opened up on Chase Street and a few houses were renovated along with brand new rowhomes and apartment buildings. 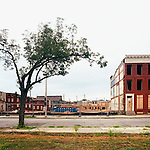 I began photographing this area when I arrived in Baltimore in Fall 2008. I also worked on an exhibition at the Reginald F. Lewis Museum called East Side Stories which focused on this neighborhood and the stories behind it. I continued to return to specific buildings and streets and rephotographing them over the course of a year to show some of the progress and also the lack of. It's an ongoing project.